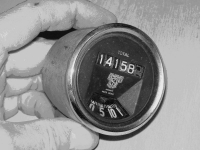 The rotating speed reading dial was stuck at the near zero position and only a sharp tap of the hand whilst driving would make the dial free to move. It would then work fine until the next prolonged stop. As I have not been able to source much information [if any] on this type of speedometer, this article is my experience and the parts names are probably not correct to those given by Lucas. Tools required: 1 x set of Jeweller’s screw drivers: 1 x tweezers; 1 x small vice or clamp; 1 x clean cloth; 1 x small brush; 1 x small pot of cleaning liquid [paraffin]. Start by removing the speedometer from the car and return to a room with plenty of light. Remove the outer chrome bezel, by holding firmly the steel case and rotating the bezel until it aligns with the cut out in the steel case. Carefully using a small screw driver prize the inner black facia from the housing. 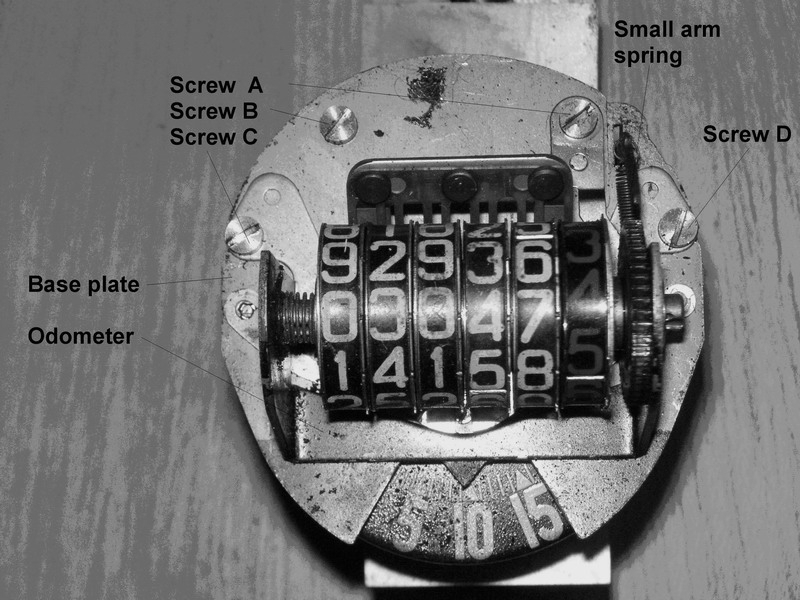 Remove the two screws at the back of the steel casing and gently pull out the inner speedometer mechanism. 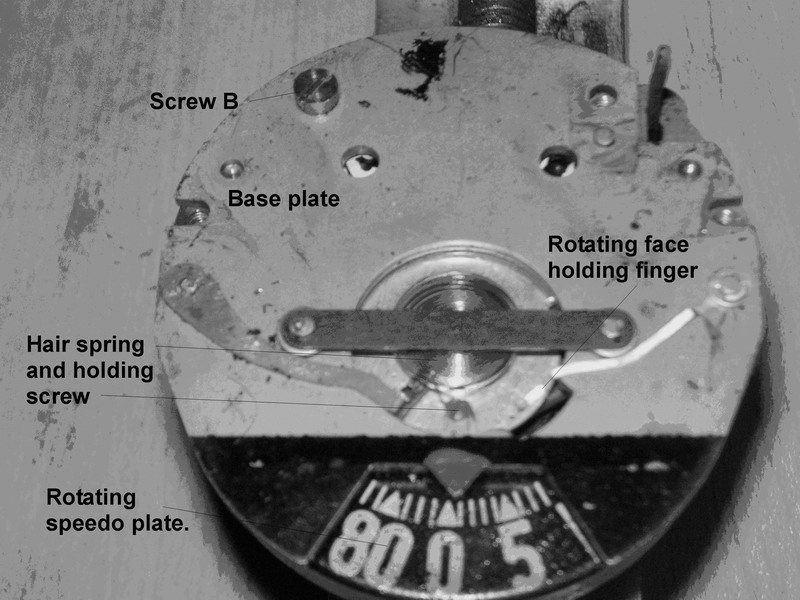 Holding the mechanism in a vice, remove three of the 4 screws leaving just screw B in place. Unhook the small arm spring and very carefully lift away the Odometer assembly. Care is needed at this point to ensure that the non-return spring, (which is held by screw A), is free and the odometer assembly can now be removed. Now the very tricky bit. You will need the smallest screw driver to remove the hair spring screw, which is the one near the red pointer, and very gently lift out the hair spring which is located in a slot under the screw. The base plate and the rotating speedo plate can now be removed. Now this exposes us to the Achilles heal of this drive [In my opinion] and is the most common causes of the failure of the speedo odometer to stop working. There is a small brass gear wheel, which is the drive of a ‘worm’ drive behind the revolving magnet, and if the small brass gear seizes in the housing [due to poor lubrication or corrosion] this then results in one or more of the teeth being stripped from the gear and the odometer is now ‘dead’. Spares are just not available. So it’s worth removing the gear from the casing and cleaning it, then applying some clean low melting point grease to the shaft. It’s worth noting that there is a small thrust washer between the brass gear and the casing. Inspection of all the parts and very careful cleaning is required. I would leave the rotating speedo face alone as the painted-on numbers are very easily removed. Re-assembly is basically the reverse of the above but great care and time is needed to ensure that the rotating speedo plate is carefully assembled and the hair spring is back under the screw. There is a very delicate spring finger which prevents the speedo plate from lifting and this can be easily distorted. If the job is not rushed, all goes back as it was. The reason for the speedo plate sticking was the result of the plate with the numbers on it becoming detached from the small spindle. This article, written by Mike Davies, originally appeared in CA7C Seven Focus in Feb 2009 pp 16-19.